Ready and waiting. We have the brooder for the chicks all prepped and even warmed up. I hope the little chicks are okay after their journey. We borrowed all this wonderful equipment from our friends the owners of Benjamin Farms. 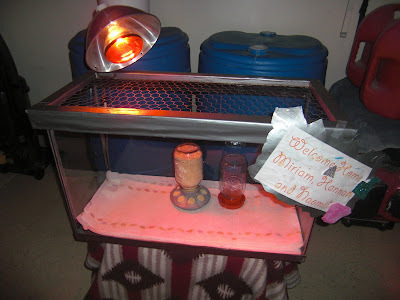 The 250 watt red heat lamp will keep the chicks at a toasty 95 degrees for their first week. We will then cool it down each week by 5 degrees until they "feather out" and are ready for the coop and yard. Apparently chicks are quite good jumpers and flyers. Hence the lid. I am still working on making them a little perch. We opted to keep our brooder in the garage. Some do it in the house, but that doesn't work for me. Ellery and Callista and friends decorated our welcome home sign. These little chicks will certainly be loved, I hope none start crowing in 6 weeks!